The Cathars left many castles throughout Rousillon and Laguedoc, the hills are dotted with Cathar castles, built on rocky outcrops in the 12th century and places of refuge in the 13th century for a persecuted sect that was finally wiped out in the Albigensian Crusades launched by Pope Innocent III. I saw many of these strongholds in the hills and mountains around Perpignan. However, instead of visiting the Cathar castles on my last day in the south of France, my friend Cathy took three of us to visit the Fort de Salses, also known as the Forteresse de Salses, an impressive and massive Catalan fortress 25 minutes from where she lives in Sainte Marie la Mer and 20 minutes from Perpignan, off the road to Narbonne. The Fort de Salses does not stand out in the same way as the hilltop Cathar castles. Instead, this fortress is almost in a hole instead of being on a hill. When we arrived, the only tour was in French, with some snatches of English. But even with my paucity of French, I could understand much of what the guide was saying and her introduction to the history of this place. This architecturally magnificent building is not a typical French chateau. It was built by the Spanish strictly for military purposes, there are no elegant rooms or beautiful works of art. The chapel is virtually bare, and there are no galleries, furniture or tapestries on display. Instead, what we saw is a testament to the ingenuity of the people who built it. Everything is carefully thought-out and designed from the ventilation to the water supply, plumbing and ventilation. The Fort de Salses was built at the end of the 15th century to guard what was then the frontier between Spain and France. Its layout and architecture were innovative at the time and today they are a rare example of the transition between mediaeval castles and the fortresses of a later period. 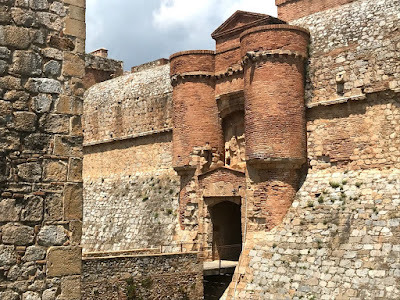 The fortress was built between 1497 and 1504 by the Catholic monarchs of Spain, Queen Isabella I of Castile and King Ferdinand II of Aragon, with the purpose of defending the border with France, especially after the last French incursion had destroyed a nearby village. Ferdinand and Isabella commissioned Francisco Rodriguez de Madrid, captain-general of the King’s Artillery, and the great Spanish architect and engineer, Francisco Ramiro Lopez, to design the fortress near the Castle of Leucate, built by the French almost a century earlier. The fortress stood at a strategic defensive position between Catalonia and France, and on a site with a source of spring water, which was important in the event of a siege. But the building project was costly, and consumed one-fifth of the Spanish crown’s annual budget. 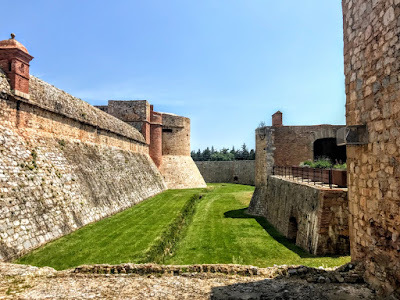 Ramiro designed an innovative fortress that looks like a hybrid between a castle and a fortress, linking mediaeval military architecture and the modern style of fortification. They were inspired by the traditions of military building in Spain, Italy and Burgundy. This new design of fortress was capable of resisting modern artillery, and could house a garrison of 1,500. It was designed on a massive scale – 110 by 84 metres – to deter potential attackers. The fortress came under siege throughout the 16th and 17th centuries, with the first siege in 1503, a year before the building work was completed. A peace agreement between Charles V and Francis I in 1544 gave the fortress some good decades of relief and peace. The Thirty Years’ War brought a change of ownership. During the last siege in 1639, the French captured the fortress after 40 days of resistance by the Spanish. The Spanish recaptured the castle in 1640, but it was finally claimed for the French crown, along with neighbouring Perpignan in 1642 and has remained a French possession ever since. Within less than 20 years, the two kingdoms signed a new peace agreement, and with the Treaty of the Pyrenees in 1659. Under the treaty, Rousillon became French and the Spanish border was pushed south to the Pyrenees. The castle was left in the middle of French territory, but without any military function or strategic role. 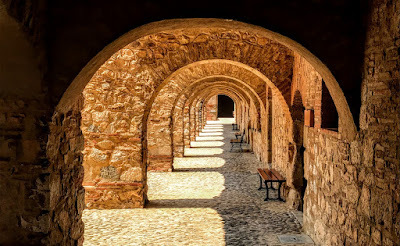 The guided tour brought us through the parade ground, along the parapets and the towers, and into the governor’s chamber, the dining room, the inner courtyard, the stores and the stables. After the end of the war, the local governments asked the French king for permission to demolish fortresses that were useless and costly to maintain. The French-built Castle of Leucate was demolished in 1664, but the higher cost of demolishing the Spanish-built Salses saved the structure from destruction and oblivion. Louis XIV turned the castle into a prison in 1682-1683. His military engineer, Sébastien Le Prestre de Vauban (1633-1707), had refortified the Palace of the Kings of Majorca in Perpginan. At first, Vauban proposed demolishing the fortress, but this proved to be too costly a project, and he began partially restoring it between 1691 and 1700. 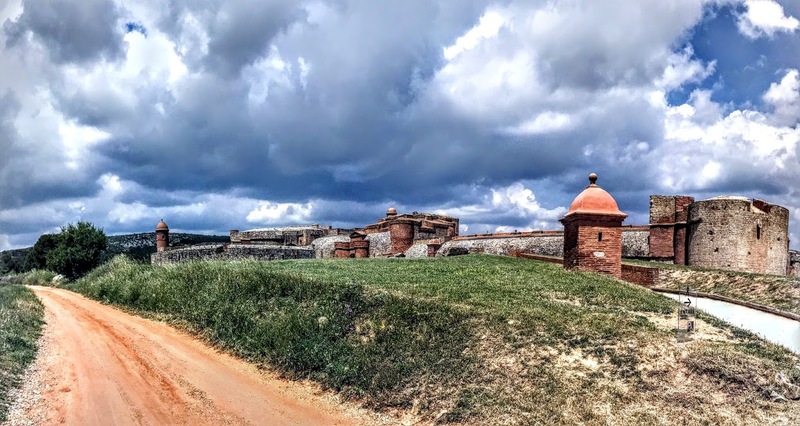 After serving as a gunpowder magazine, a prison, and and infantry garrison in its post-war life, the Château de Salses was listed as a French historical monument in 1886 and decommissioned as a fort three years later, saving the fortress from destruction. The Forteresse de Salses was handed over to the Department of Fine Arts in 1930, and then to the Ministry of Culture’s Heritage Department. During the Spanish Civil War, the fort was used as a refuge. Since 2000, a number of well-known artists have created works for the fortress. Today, the Château de Salses house the Museum of History of Salses, and is visited by about 100,000 people each year.